Copper bottle trees can be quirky and decorative accents in your garden. Build any size copper bottle tree you like from soft copper tubing and copper pipe. Bottle trees are steeped in southern tradition; blue glass bottles hanging on bottle trees in the front yard were believed to ward off evil spirits. Today’s gardener can enjoy the eclectic nature of a copper structure filled with colorful glass bottles. If the glass keeps the evil spirits at bay, consider it a bonus. Cut a length of copper pipe 18 inches longer than the desired height of your copper bottle tree. Copper pipe is stronger than copper tubing and is the trunk of your copper bottle tree. The extra 18 inches is the depth the tree will be inserted into the ground. 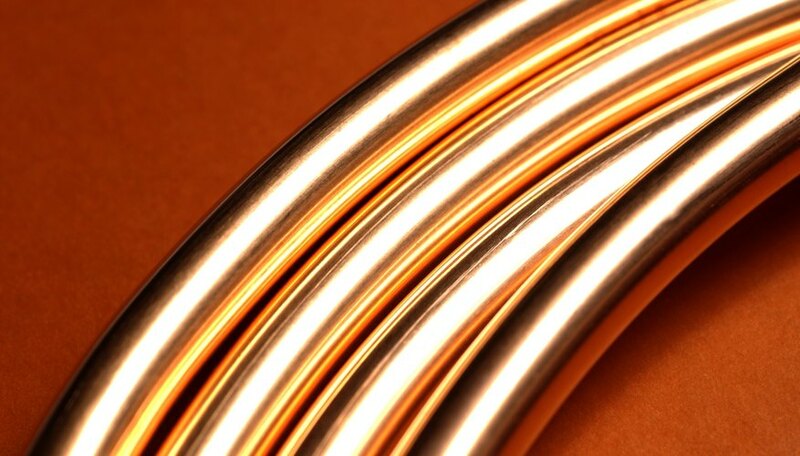 Cut at least six 18- to 24-inch-long sections of copper tubing. If you angle your cuts, the copper limbs will fit at an angle against the tree. If you make straight cuts, you can bend the soft copper tubing to angle up so they can hold the bottles. These are the branches for your copper tree, so cut as many as you like. Mark the length of copper pipe to designate where you would like to place your copper tree branches. Place the branches so that the tree is balanced, but remember to leave at least 18 inches at one end free of branches. Shape the copper tubing as you like to form the branches. Soft copper tubing is malleable; you should be able to bend it with your hands. Attach the copper branches to the copper pipe with solder and a propane torch. Add flux to both the pipe and the tubing before you solder. Insert the end of the copper pipe at least 18 inches into the ground. Invert your colored bottles and place them over the ends of the branches.